Also known as the Goberian, this designer dog is a mix between the gentle Golden Retriever and the Siberian Husky. If you haven’t heard of it, don’t feel too out of the loop – this is a relatively new breed that has only popped up in the last decade. Goberians are a product of a medium-sized breed (Husky) and a large breed dog (Golden Retriever), so they can be medium or large when fully grown. They usually measure 20 – 24 inches (50 – 60 cm) and weight can range between 40 – 80 lbs (18 – 36 kg). As for looks, while she can have Husky features, the head is usually rounded with a narrow muzzle and ears that hang down, much like a Golden. She often inherits the piercing blue eyes of the Husky, though they can sometimes be brown. She also tends to have the fluffy, curled tail of a Husky, too. 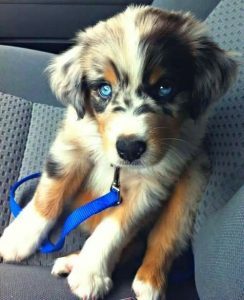 Golden Retriever Husky Mixes have a double coat – the inner coat is dense and soft, and the outer coat is long and can be wavy. Prices range from $250 – 1500 for this dog, with the blonde, blue-eyed beauties coming in at the higher end of the price range. Taking after both their parent breeds, these dogs are very quick to learn. Goberians have been trained to take part in a range of activities, from hunting and agility to guarding and search and rescue. A warning, though – they can show the Siberian’s stubborn streak, so you’ll need to establish yourself as pack leader from the start by being firm and consistent. This means that when you set boundaries, you must stick to them. For example, if you want to make it a rule that she isn’t allowed on the sofa, never make an exception – no matter how cute she looks! a high-energy dog that likes to explore and have a job! In other words, think: Golden, but with your foot on the accelerator. So, a word of warning: don’t consider getting this dog if you just want a chilled out companion. If not exercised properly, a Golden Retriever Husky Mix will resort to destructive behavior, which will just be stressful for all involved. So, how much exercise does she need? The answer at least an hour a day, plus lots of play. This dog does well at agility, fetch games, and she makes a great running or hiking partner. When you’re out on a walk, you can make it even more challenging for her by fitting her with a doggy backpack. This will fulfill her need for a job, too, as she will be carrying a weight like her Husky parents. These packs are especially useful when you’re on a long hike together, as she can carry water, treats, poop bags, a ball, and any other small items you need for the walk. To start with, she should carry between 10 – 12% of her bodyweight. As we have seen, Golden Retriever Husky Mixes are medium to large, energetic dogs that were bred to work. Due to their size and energy levels, they need a place to live that provides adequate space for them to move around in. For this reason, I wouldn’t recommend getting this dog if you live in an apartment. The ideal home for her is a house with a spacious garden she can run and play in. Goberians can inherit the “escape artist” streak from the Husky, so the garden should have a fence at least 6 feet tall to stop her from getting out. That’s right; these dogs can jump high. Alternatively, you can get large exercise pens to provide a secure and comfortable area for your dog move around in. Goberians are often described as having the drive of the Siberian Husky mixed with the gentleness of a Golden. This quality makes them great companions for a family with children, as their playfulness is usually paired with an awareness they need to be more careful around young ones. 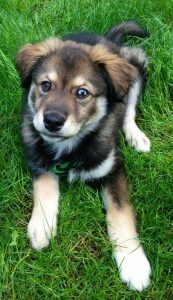 This low level of aggression towards the young is common among most Husky mixes, like the Husky Pug Mix. These are truly loyal dogs who bond strongly with their family and love to be around them. Their sociable personality tends to mean they don’t like being left alone for long periods of time, so I don’t recommend leaving her for more than 3 hours at home alone. The Goberian’s fierce loyalty makes her a protective dog. So, she also makes a good watchdog and won’t hesitate to defend you and yours against an intruder. Remember that dense double coat I mentioned earlier? Well, you’ll be glad to know it doesn’t shed heavily as with some dogs who have this kind of coat. Don’t put that brush away just yet, though. The Goberian still needs grooming twice a week for 5 minutes. This will remove loose hairs and keep her coat looking healthy and tangle free. As you may be able to guess, the Golden Retriever Husky Mix’s thick double coat is designed to keep her warm by providing a great deal of insulation. For this reason, these dogs find it difficult to tolerate hot weather and are better suited to living in moderate to cool climates. So, if you live in an area where temperatures regularly rise to 80 degrees (26ºC) or over, don’t consider getting a Goberian. During the summer, you should exercise her in the morning or in the evening to avoid higher temperatures. Any higher than 68 degrees (20ºC) or over is too hot for her to do any vigorous exercise.In the hotter months, be mindful that her water bowl will need constant refills. It’s a good idea to place a few different ones around the house and one in the garden, too. That way, there’s less refilling for you and less walking to and fro for her. Also, make sure she always has access to a shaded area when she is outside. While Goberians are generally healthy dogs, they are prone to some health problems which they can inherit from their parent breeds. Plenty of exercise and a healthy diet are an essential part of keeping your pup in tip-top shape. In fact, there are specific ingredients that you can look out for in dog foods that can alleviate and, in some cases, prevent certain health conditions. Both the Golden Retriever and the Husky are prone to hip and elbow dysplasia, making the Goberian quite likely to develop this condition in middle – old age. Symptoms include joint pain and stiffness, limping, and, in severe cases, lameness. While there is no repair for structural damage to a dog’s joints, such as torn cartilage, there are nutrients that can help alleviate joint pain by decreasing inflammation and repairing damaged tissues. The main helpers here are glucosamine and chondroitin, which are often included in foods for large breed and senior dogs. Omega fatty acids also help by reducing inflammation, so it’s a good idea to choose a dog food with a fish-based protein source or flaxseed. The Goberian can suffer from eye problems, including juvenile cataracts, corneal dystrophy, and progressive retinal atrophy, which they inherit from their Husky parent. While none of these conditions are life-threatening, they can all lead to blindness. To promote your pup’s eye health, you can search for dog foods that are high in specific antioxidants, including Vitamin C, Vitamin E, beta-carotene, among others. 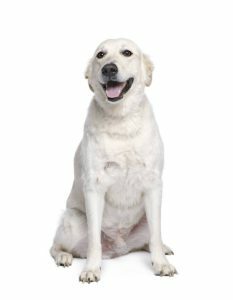 Golden Retrievers are susceptible to certain cancers called lymphoma and hemangiosarcoma, which can unfortunately also occur in the Golden Retriever Husky Mix. While, of course, diet cannot cure cancer, you can keep your dog as healthy as possible by feeding her a high-quality dog food full of antioxidants, which help to prevent free radical damage. Given that both of their parent breeds can suffer from heart problems, Goberians are susceptible to this health issue, too. For dogs with heart conditions, a low sodium diet is essential, so go for a dog food with no added salt. You should also keep her at a healthy weight by feeding the correct portions and giving her adequate daily exercise. A dog that’s in shape will have much less chance of developing coronary issues. 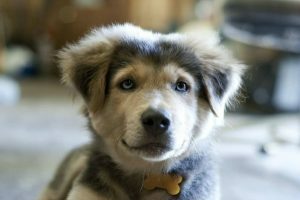 Healthy breeding also plays a large part in ensuring your Golden Retriever Husky Mix doesn’t suffer from certain health conditions. Make sure you get your pup from a responsible breeder who can provide evidence of healthy breeding. For the Goberian, this will include being able to produce independent certification that the parents of the dog have been screened for the above health conditions and been classed as healthy for breeding. A good-quality breeder will also be happy to show you the parents and the rest of the litter and as well as their living quarters. Of course, adoption is also an option. There are plenty of dogs out there in need of forever homes. And, though they’re rare, if your heart is set on a Goberian, you might just have luck. 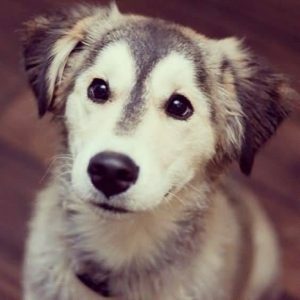 Puppy Finder – find dogs up for adoption and for sale. Adopt a Pet – you can search by breed, age, gender, color, and size. Pet Finder – you can search by breed, age, or gender, and you can also check whether you want a house trained dog or a one who is good with children and other animals. So, what do we know about the Golden Retriever Husky Mix? This is a loyal dog, ideal for active families who live in a house with a garden. They’re smart, protective, and quite the lookers in the dog world. Do you think you’ve got what it takes to look after and raise one of these beauties? If so, make sure you get her from a reputable breeder who can prove she is a product of healthy breeding. These dogs, like all dogs, are susceptible to health problems passed down from their parent breeds, and a responsible breeder will always make the health of the dog a priority.